A stunning studio flat situated on the second floor of a secure purpose-built block boasting bright interiors throughout, a separate kitchen and an excellent location moments from Victoria Park. The property is situated moments from the green open spaces of Well Street Common and Victoria Park. 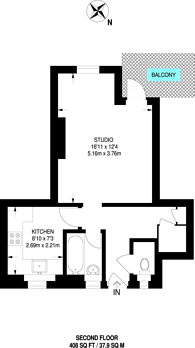 408 (37 Sq M) approx.